Sometimes in life, we need a hand to accomplish a task, even when cooking. At Season’s Eatings we’ve recently discovered the essential Waitrose Beetroot Salad, which we find a delicious shortcut for a variety of meals. Our recipe this week is a salmon and beetroot salad – a pairing of two flavours that you wouldn’t initially consider together but they do pair well. This simple supper , courtesy of this Waitrose shortcut, is simple to make, quick and rewarding – perfect after a busy morning out. Of course you are more than welcome to buy fresh beetroot, boil and cut, but this shortcut takes away none of the flavour. This recipe comfortably serves two. Cook the new potatoes in salted, boiling water for 12 minutes. Whilst the potatoes are cooking, place the salmon fillets in shallow bowl and cover a plate. Pop in the microwave and cook on high for 3 – 4 minutes. The exact time depends on whether you’re cooking them from fridged or frozen, just ensure you check every minute to make sure you don’t over cook the salmon. Once cooked (or rather steamed), set aside for a couple of minutes and leave to cool. For the dressing, mix together the olive oil, white wine vinegar and mustard with a very small pinch of salt and small twist of freshly ground black pepper. Check that the potatoes are done, drain and then you’re ready to serve up. 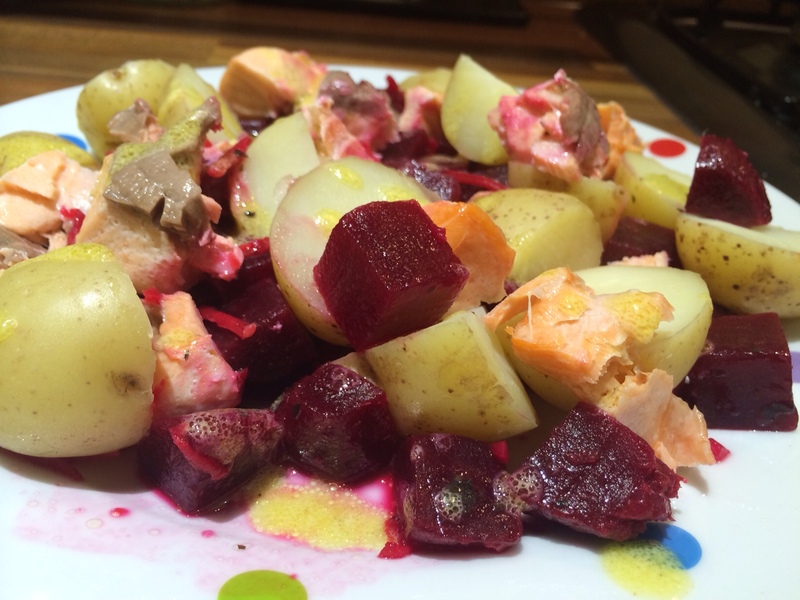 Portion half the potatoes onto each plate, then add the beetroot salad. Finally, remove the skin from the fish and flake each fillet on a plate. Whisk the dressing up one final time and drizzle over the salad liberally.